Children make up 36 percent of the those making the perilous migration journey across the sea, often to flee conflicts. As the refugees crisis surges on with thousands of refugees from the Middle East attempting to cross the Mediterranean on route to Europe, two children have drowned every day since September 2015 and the death toll of victims continues to climb. According to the U.N. refugee agency UNHRC, UNICEF, and the International Organization for Migration, the iconic image of drowned Syrian toddler Aylan Kurdi is the just the face of a larger epidemic of child deaths in the Mediterranean, where at least 340 child refugees, including many babies, have drowned. In the face of the heart wrenching crisis, the international groups called for urgent efforts to help refugees safely escape the harsh conditions they are facing without putting themselves in more grave danger. “These tragic deaths in the Mediterranean are unbearable and must stop,” said UN High Commissioner for Refugees Filippo Grandi. “Clearly, more efforts are needed to combat smuggling and trafficking.” Grandi added that safe travel options for refugees must be prioritized to as part of the effort to tackle the crisis. 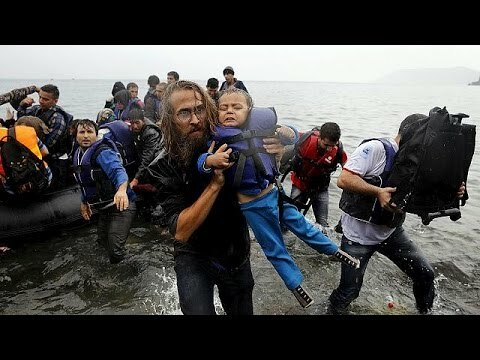 According to the international organizations, children now make up 36 percent of the migrating population, meaning children are increasingly at risk among those making the perilous journey by boat from Turkey to Greece in a course on the Aegean Sea that has proved to be a deadly passage for refugees. And the death toll just keeps rising. In the first month and a half of 2016, 410 people out of the 80,000 making the Mediterranean trip have drowned, marking a sharp 35-fold increase from the beginning of 2015, the organizations reported. Experts have pointed out that unreliable boats and inadequate lifesaving equipment on board do not provide the necessary insurance to make sure refugees can make a safe passage. Rough winter seas that boaters are now facing only make matters worse. According to UNHCR, a total of 80,000 refugees landed in Europe in the first six weeks of 2016, surpassing the first four months of 2015 refugee arrivals combined. Over 3,700 people died trying to cross the Mediterranean in 2015.